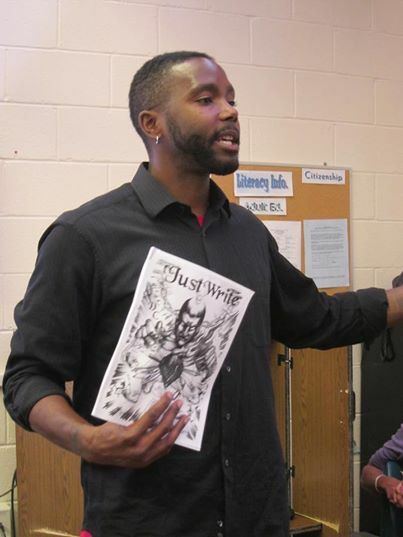 About the guest blogger: Hakim Bellamy became the inaugural poet laureate of Albuquerque on April 14th, 2012, at age 33. He was the son of a preacher man (and a praying woman). His mother gave him his first book of poetry as a teen, a volume by Khalil Gibran. Many poems later, Bellamy has been on two national champion poetry slam teams, won collegiate and city poetry slam championships (in Albuquerque and Silver City, NM), and has been published in numerous anthologies and on inner-city buses. A musician, actor, journalist, playwright and community organizer, Bellamy has also received an honorable mention for the Paul Bartlett Ré Peace Prize at the University of New Mexico. Bellamy is the founder and president of Beyond Poetry LLC. For more information on the author, please visit www.hakimbe.com. I want to think about my future. but my heart is in the streets. praying to God on my knees . I am tired of making mistakes. My mind is in a place it cannot escape. My son looks me in the face. Is it a man he sees? I tell him about the streets and the damage it brings. Rochester, New York is where you find me. filled with so much pain. Rochester, the city inside me. It’s a simple prompt, or so I thought. Describe the city inside of you. What is the weather like in that city? What are the people like in that city? What are you like, in that city? Having served on the Governing Council of Gordon Bernell Charter School inside of Bernalillo County Metropolitan Detention Center (MDC) I have a fairly nuanced understanding of corrections and incarceration in this country. Enough to know that many of these men at Monroe Correctional Facility where probably not even from Rochester, NY. They’d likely been displaced from their hometowns and families, moved like chattel, but no matter where they go there is a piece of their city inside of them. I was so fortunate to be invited into the Monroe Facility by Dale Davis of the New York State Literary Center and poet John Roche. I had roughly 90 minutes to work with about 30 men. At 35, I was one of the youngest Black men in the room. And most of these men were black. Incredulously, I find the same overrepresentation of Black bodies in the pods at MDC in New Mexico. The only difference being that New Mexico has a 2% African American population per the last Census. So we went to work on that right away. When teaching artists go into correctional facilities we are not there to entertain or be part of some enrichment programming, we are there to transform. We are transformed. Because the best way to teach is by example, so I shared with them some tough poems about identity and a rap or two about fear and fatherhood. I used the first 30 minutes to tell them Where I’m From (sans the poem prompt by George Ella Lyons), and also share with them this transformational arc in my own life, that I document through my practice of poetry. And for the last hour of the workshop, I give them that practice. Together we remember, reflect, write, reflect, share, reflect and let that resonate. Sure, they learned (or were simply reminded) that the weather inside them, is changing. Just like weather is always changing in a city, just like people are always changing in a city. That’s inspiring when you are inside and “outside” is something that is rationed to you. But what they really learn is community. As a group they took a risk with me. They decided to share some of where they are from and some of who they are inside with each other and some dude they barely met (me). In that short period of time, we established a space where folks felt safe to take risks (whether that be reading in front of the group or sharing personal thoughts) and we brought people together through the practice of listening. Frankly, adults on the outside need these skills as much as these men did. And skills like these, like empathy, like compassion, like communication and understanding, take practice. My job is not just to help Manuel imagine a city inside of him, my job as a teaching artist is to help him create that world around him. Poetry is just one tool to help that process of reconstruction.